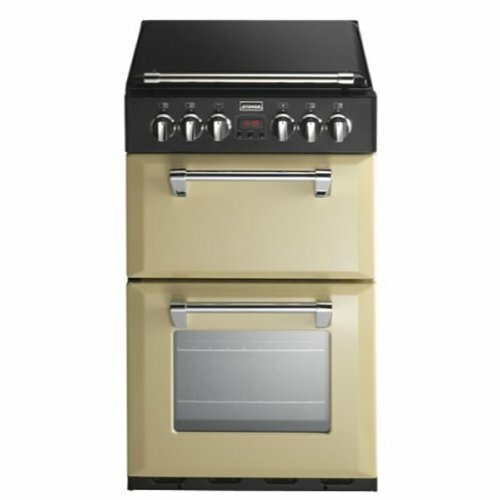 The Richmond 550ECHA Mini Range Cooker is a double oven cooker with a fantastic ceramic hob. The stylish cooker has a main cavity which is an electric fan oven which has a 69 litre capacity, easily big enough to cook all of your family meals. The cooker also has an LED clock and programmer to help cook your food to perfection. The top cavity is a 39 litre conventional electric oven. The cavity also contains a superb electric grill. The beautiful design also stretches through to the cast lid with chrome handles, which hide the equally stunning ceramic hob, each with 4 zones. With all of this cooking space, quality and design, the Richmond 550ECHA Mini Range Cooker is desirable in any home.